Special forces have arrested an alleged Islamic State (IS) group supporter in the Austrian capital Vienna, who is believed to have tried to derail trains in neighbouring Germany. The 42-year-old Iraqi national is thought to have twice put obstacles on rail tracks last year. Flags for the IS group and writings in Arabic were found nearby, prosecutors said. German and Austrian investigators are now questioning the man in Vienna. Local newspaper Kronen Zeitung reports the father of five served for 15 years in the Iraqi army. He was living in Austria as a refugee and worked for a security company, it says. Where is IS still active around the world? 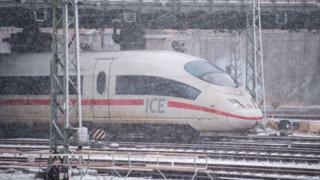 Prosecutors believe that in October last year, he and others strung a steel cable over tracks between the German cities of Munich and Nuremberg which damaged the windshield of an Inter City Express train. Cement blocks were placed on the rails two months later, although nobody was hurt. The group's aim was to derail the trains, the prosecutors said. Bavaria's Interior Minister, Joachim Herrmann, reportedly praised the "excellent international co-operation" in a press release, and said the investigation was going "at full speed" to establish the facts. It comes just days after German police arrested 10 people on suspicion of planning an Islamist attack. Prosecutors said those suspects had plotted to "kill as many 'non-believers' as possible". Germany has been on high alert following several jihadist attacks in recent years. The most deadly was in December 2016 when a man drove a lorry into a crowded Christmas market in Berlin, killing 12 people. Anis Amri, the Tunisian behind the attack, was shot and killed in Italy four days later.